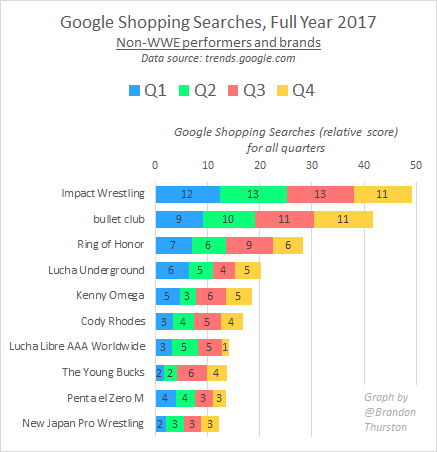 Like in 2016, when it comes to worldwide Google Shopping searches, John Cena was head and shoulders above the others in the wrestling industry in 2017. After Cena, A.J. Styles edged out Roman Reigns. In 2016, Reigns was a decisively #2 for Shopping searches, ahead of Styles at #3. Reigns still led Styles for normal web searches in 2017 by a wide margin. In his first full year on the main roster, Finn Balor placed sixth among those for whom data was collected. Data was collected for all members of the WWE main roster and for select other wrestlers and brands associated with NXT, 205 Live, New Japan Pro Wrestling, Ring of Honor and Impact Wrestling. Inactive WWE wrestlers like Steve Austin, Ric Flair, Shawn Michaels and Randy Savage were also included. Google Trends doesn’t provide absolute numbers of searches, only relative values. Since Cena had the highest peaks for searches, all others in this list were held to the value of his high standard. Note that a few people are essentially represented twice in this list. For example, “Nikki Bella”, “Brie Bella” and “The Bella Twins” each have their own categories of queries in Google Trends. Likewise, the members of the New Day and the Hardy Boyz are represented individually and collectively. For whatever reason, the Bullet Club is not yet recognized as its own category in Google Trends, so the lone query “bullet club” has been included here, which is why it’s listed in all lower-case. Before you take to Twitter to celebrate or bemoan the supposed merchandise sales of the wrestling personalities you either love or loathe, please note Google Shopping search data considered in this article are not outright indicative of who sells the most merchandise, however I think they are a worthy, if imperfect, suggestion. Although it is a publicly-traded company, WWE doesn’t publicly report any sort of breakdown about which individuals sell how much merchandise. SEC rules don’t require WWE to reveal such information. The faces that appear most prominently on WWEShop.com are also a worthy suggestion about who the merchandise sales leaders are. As of this writing, the faces WWE has select to appear on the website when you hover over “Superstars” are: Cena, The Shield collectively, Steve Austin, Rusev, Finn Balor, Alexa Bliss, A.J. Styles and Sasha Banks. To get an idea of the trajectory of the above Google Shopping search ranking, I compared searches from the first-half of the year to that of the second-half of the year, for the 50 people/teams/brands listed in the graph above. Ric Flair leads this list, followed by Randy Savage. Braun Strowman and Dean Ambrose made the biggest positive differences for the second-half of the year versus the first half. Increases in shopping searches for Flair followed his health scare in August 2017. ESPN also prominently aired a documentary on Flair in November 2017 as part of the network’s “30 For 30” series. Strowman’s increase followed his singles push in the year. Ambrose was likely helped by the Shield reunion and having the lowest number of shopping searches among the three Shield members. Flair still leads this listing, followed by Kurt Angle who returned to WWE television in January 2017 after an absence of ten years. If we’re looking for emerging stars who are catching traction, it interesting to note the increases in searches for at least Strowman, the Usos, Alexa Bliss and Balor. Samoa Joe, Naomi and Kenny Omega didn’t have enough searches to make the original list of 50 but had large increases by percentage from the first-half to the second-half of 2017. Data was collected for the likes of Kazuchika Okada, Hiroshi Tanahashi, Tetsuya Naito and Los Ingobernables, CMLL, Joey Ryan and Candice LeRae, but they didn’t make the top 10 for shopping searches in 2017. Follow Brandon on Twitter at @BrandonThurston. Email him at [email protected]. He co-hosts Wrestlenomics Radio, a weekly podcast on wrestling business.